1977 1978 Dodge Macho Package Ramcharger 4x4 Four by Four Trucks were big, strong and let you cruise in style while working. Our Mopar Authentic Restoration Produce decal and stripe kit brings your vehicle back to its original appearance. 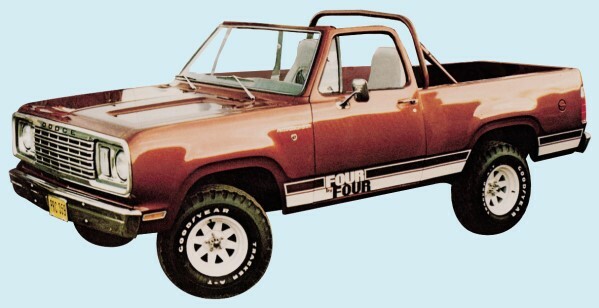 Manufactured to meet or exceed factory specs, our stripe kit repairs and restores your 1977 1978 Dodge Macho Package Ramcharger 4x4 Four by Four Truck like it just rolled off the assembly line. Increase the value of your classic muscle truck with an inexpensive stripe and decal kit from Phoenix Graphix. Dodge 'PowerWagon 150' Body Names (2.5" X 11.75" decals) (P/N DTK106) (2 required) $14.50 ea.